The Montreal-based conglomerate, which provides parcel delivery, truckload and less-than-truckload freight hauling, plus warehousing and transportation management services logistics throughout North America, said it earned C$86.7 million on revenue of $1.13 billion in the three months ended Sept. 30. That compared with net income of $98.8 million on revenue of $1.07 billion in the same period a year ago. The decline in net revenue was mainly the result of an extraordinary gain of $59.7 million on the sale of property in the third quarter of 2017. Excluding that gain and other adjustments related to amortization of intangible assets related to acquisitions and net foreign exchange gain or loss, TFI reported adjusted net income of $94.5 million in the third quarter of 2018 versus $48.8 million in 2017. It was the fourth consecutive quarter of sequential improvement in the United States, Bedard noted. TFI’s U.S. holdings include truckload carriers Transport America and CFI, plus the former courier operations of Dynamex Inc. In a conference call with investment analysts, Bedard said he does not expect to see an influx of parcel business due to a series of rotating strikes against Canada Post that began Oct. 22. “We’re really busy with existing customers,” he said. 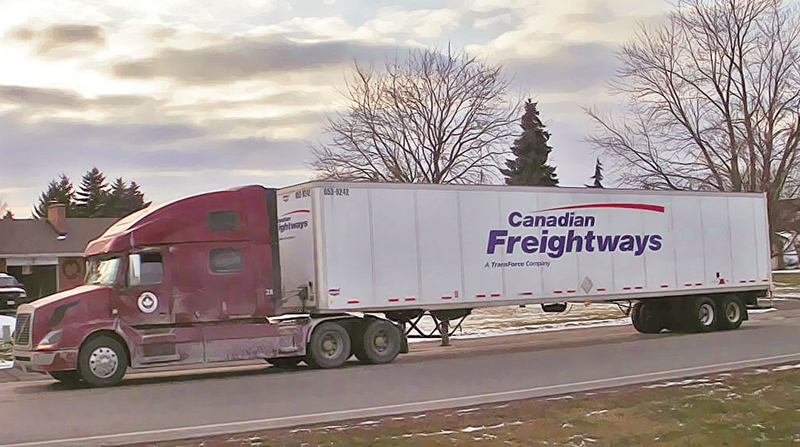 Bedard said the company is trying to keep up with strong growth in demand for cross-border and intermodal freight shipping, while letting go of some less profitable over-the-road LTL business. Tariffs imposed by the United States on Canadian steel and aluminum have reduced some demand for flatbed service, but not enough to diminish overall sales, he noted. TFI International ranks No. 9 on the Transport Topics Top 100 list of the largest for-hire carriers in North America. For the first nine months of 2018, TFI said net income was $215.3 million, or $2.37 a share, compared with $37.8 million, or 41 cents a share, in the same period in 2017. Revenue reached $3.35 billion in 2018 from $3.31 billion in 2017. Breaking down results by division, TFI said truckload operating income was $60.5 million on revenue of $520.6 million in the third quarter of 2018, compared with operating income of $16.7 million on revenue of $485.1 million in 2017. Package and courier operating income was $28 million on revenue of $154.6 million in the third quarter of 2018, compared with operating income of $23.6 million on revenue of $150.8 million in 2017. Less-than-truckload operating income was $25.5 million on revenue of $227.5 million in the third quarter of 2018, compared with $14.1 million on revenue of $217 million in the year-ago period. Logistics and last-mile operating income was $16.8 million on revenue of $234.7 million in the third quarter of 2018, compared with $13.3 million on revenue of $229.8 million in 2017. In a separate announcement, TFI said Diane Giard has joined its board of directors. Giard most recently served as executive vice president of personal commercial banking and marketing at National Bank of Canada. In July, TFI added Leslie Abi-Karam, a former executive at Pitney Bowes, to its board.